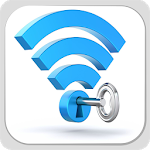 Wi-Fi Password Recover cracks the Wi-Fi to recover your Wi-Fi default password. 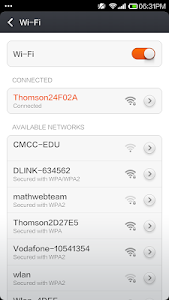 The purpose of this application is to audit the security wireless networks of us or recover lost default key of own Wi-Fi network. In no case should be used to crack the password of a wireless network that is not us owned or without the consent of the owner. The use of the application for this and other purposes for which it wasn’t designed, will be under the responsibility of the user. 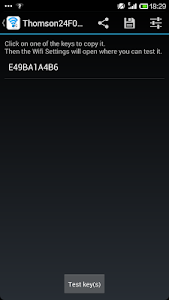 Ensure SD card installed. The application need SD card to install a 66Mb Dictionary, which is smaller and more efficient than anything else available on the market. This file should be downloaded by default to your SD card, though you can select the folder where the file is on the preferences menu. Alternatively we can use your Internet connection instead of the dictionary. This option can be activated in the settings menu. 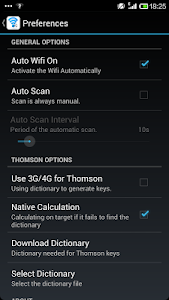 It also can calculate natively the key although it will take about 2 minutes in less powerfully phones and about 10 seconds on a Samsung Galaxy S. This tool also detects the new 2010 Thomson routers for which keys cannot yet be generated. Support for Meo Pirelli and Belkin routers. 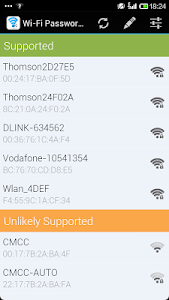 Similar to "WiFi Password Recover"